Westchester’s Keith Thomas was voted the NJCAA Region XV Division I Player Of The Year for the 2013-2014 season. 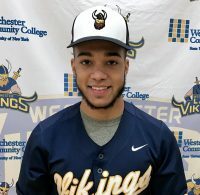 Thomas led Westcos to a 26-4 overall record and the second-seed in the Region XV DI Tournament scheduled this weekend at Suffolk. Teammate Giovanni McLean was selected to the All-Region Second Team. While Joel Angus Jr. was selected to the Sportsmanship Team. Westchester Coach Tyronne Mushatt was named the Region XV DI Coach Of The Year.